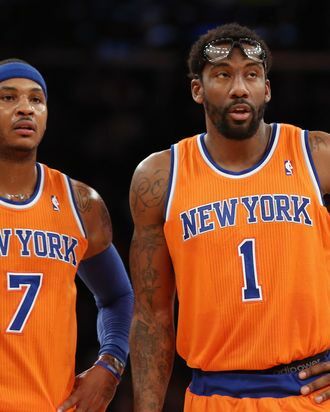 Carmelo Anthony #7 and Amar'e Stoudemire #1 of the New York Knicks wait for play to resume during the second quarter against the Boston Celtics at Madison Square Garden on December 8, 2013 in New York City. It really seemed like the Knicks had turned a corner for a hot minute there. They snapped a nine-game losing streak by beating the Nets by 30 points on Thursday, then blew out the Magic by 38 points on Friday. And then yesterday happened. Suddenly remembering that they are the Knicks, the Knicks lost to the Celtics on Sunday by 41 points — their third-worst home loss in franchise history. The Knicks will look to rebound against the Cavs tomorrow night, and based on how things have been going, they will either win by 45 points or lose by 70 points.